Sunday brunches, or brunch on any day, are a fun and sweet way to celebrate an event like a baby shower, birthday, the day after a wedding, or just celebrate your family and friends! 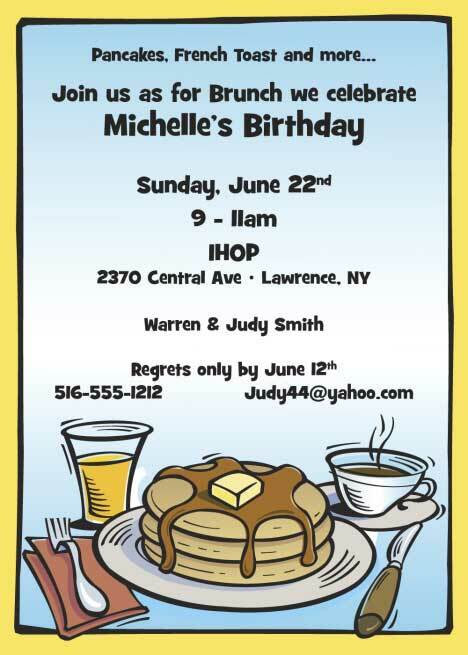 You can hold the brunch at your house or out at your favorite restaurant or party room. Invite your guests to an ultra chic brunch with these cute personalized dot invitations, or if you are doing a breakfast brunch check out these cute personalized brunch invitations. Throw in some confetti to fit your theme, like baby girl confetti for a baby shower brunch, or hearts confetti for a bridal shower brunch or the day after the wedding brunch. Very cute! Sometimes it’s best to pick a color scheme, so if it’s spring time use pastels, or the fall use primary colors. The decorations should be sweet and simple like balloons and flowers for the tables and as centerpieces. Votive candle are also a nice touch. Grab a banner or two to celebrate the event. You can also just go for a chic look! Red gingham paper goods fit great in any party. If you are doing a baby or bridal shower brunch, make decorative centerpieces for your theme and give them as party favors or prizes for winning games. Brunch is typically a breakfast event, but some people aren’t fans of breakfast so you should also serve sandwiches, or lunch type items and finger foods. Of course you need to have mimosas! Grab some plastic champagne glasses, and equal parts of champagne and orange juice (for a twist, try passion fruit juice). Strawberries are a sweet garnish! Brunch typically entails eating, but what to do after eating? Depending on the event there are several games and activities that you can do. Check out our bridal shower games page and our baby shower games page for specific party games. It’s always fun to get to know your friends and family a little better. Try this game, called ‘Two Truths and a Lie’, where everyone writes down two truths and one lie about themselves. Put the folded pieces of paper in a bucket and have everyone grab one, the grabber then has to guess which statement is a lie. 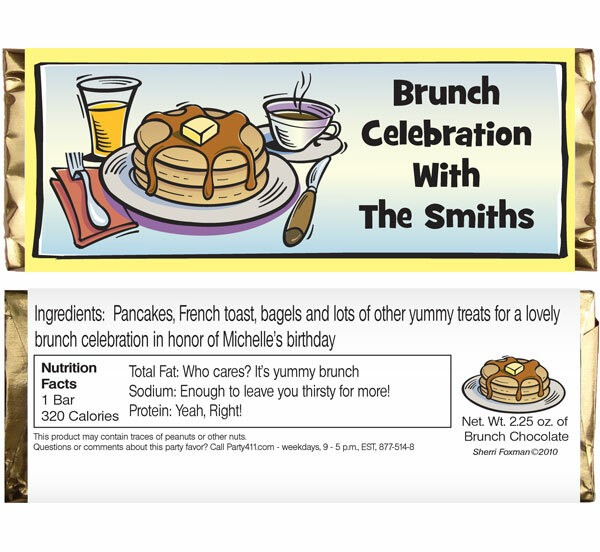 How about a cute personalized brunch candy bar wrappers? 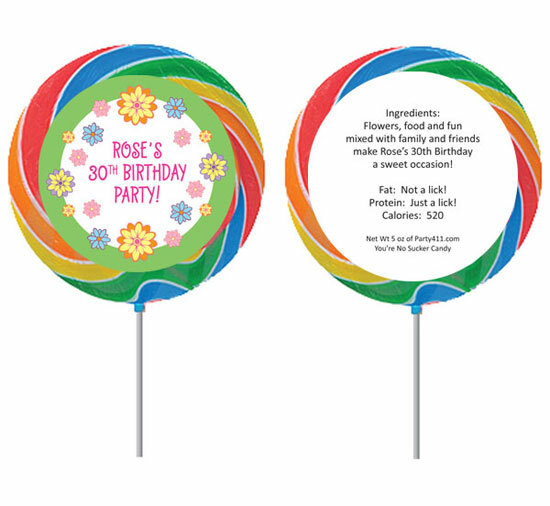 Personalized lollipops are also great!